By all the stats, the Padres are a far superior team to the Nationals, with a 13-game advantage on their record, superb starting pitching and an active offense. Tonight, they were no match for the Washington Nationals and the record-setting heat at Nationals Park. While that heat may usually come in the guise of Stephen Strasburg’s brutal fastball, tonight it came in the game time conditions. The 99°F temperature at game time was the hottest game in the franchise’s post-move history, and it was significantly warmer before the game. The Nationals would give up a run in the first, but would respond with three of their own. Clayton Richard would walk both Adam Dunn and Josh Willingham with two outs to load the bases for Pudge Rodriguez. Pudge would punch an RBI single over the second baseman, and Michael Morse would follow with another pair of RBI, making Richard pay for his walks. For the first time in a week, the Nationals would hold the lead in the beginning of an inning. Livan Hernandez would give up single runs in the first and third, but for the most part kept the Padres offense in check. He’d give up a pair of hits to just three batters: Jerry Hairston, Jr, Adrian Gonzalez and the pitcher, Clayton Richard. Ryan Zimmerman and Ian Desmond both clubbed solo homers to left field in the 4th and 5th respectively, to pad the 3-1 lead to a 5-2 lead going into the 8th. 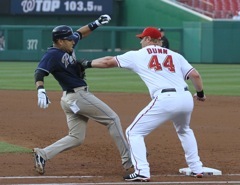 The game took a nasty turn in the 8th for the Nationals. Livan went out to face the first two batters, both of whom singled to right. That would end his night at 7+ IP, and 111 pitches. Tyler Clippard would come on, and would give up consecutive singles to Headley and Torrealba, plating Gonzalez. Cunningham would sac fly to left, scoring Hairston, and ending Clippard’s night. Sean Burnett would come on and get a ground ball to Guzman, who would flip it to Desmond, who would make an inadvised wild throw into the Nationals dugout, scoring Headley and tying the game at five. Up first for the Nationals? Ryan “Walk-Off” Zimmerman. He connected with the second pitch from Gregerson and sent it deep over the centerfield fence. Mr. Walk-Off had done it again. After the game, manager Jim Riggleman said that Zimmerman “displayed everything” in the game tonight, great defense and strong offense, to launch the Nats to victory. Tonight was a bungie-cord night for Ian Desmond, who launched a homer in the fifth, made a potentially critical error in the eighth, and then preserves the tie with a rocket throw to Pudge Rodriguez in the ninth. That’s what’s most frustrating, in watching Desmond, is that his defense rockets back and forth between brilliance and failure. Part of being a major leaguer is consistency, and Desmond has yet to be a consistent positive presence on the left side of the infield. Here’s hoping he can get it together on a more regular basis. Tomorrow, when the mercury is supposed to further eclipse the triple-digit mark, the Nats will send J.D. Martin (0-4) up against Jon Garland (8-5) in a pitching mismatch that will require some rock-solid defense, and the sort of offense we’ve seen from the Nationals this past week or so. Another walk-off homer from Ryan Zimmerman wouldn’t hurt.